Hualalai Resort on Hawaii’s Big Island welcomes families of all sizes, with hundreds of activities available, such as this Ocean Life Exploration activity. A growing trend in family travel has opened up the core family to include grandparents. Multi-generational travel, which includes grandparents with parents and grandkids, and grand travel, which often is just kids and grandparents together, are both seen a huge rise in frequency over the past few years. Have your clients try one of the following vacations on for size. Grand Velas Resorts in Mexico know how to treat grandparents right. Through Dec. 19, grandparents are enjoying rates starting at $65 per night at two of its Mexican properties, Grand Velas Riviera Nayarit and Grand Velas Riviera Maya, through a Family Reunion package. The savings come when grandparents join their family for a Mexican family vacation. Families need only book four suites for a minimum of three nights in order for grandparents to qualify. And there are plenty of opportunities at these properties for families to stay entertained during those four days. The Family Reunion package includes such amenities as a family photo souvenir and the services of a reunion coordinator to help plan events and activities, with choices such as a guided tour of the property’s cenotes (sacred Mayan wells), a trip to Xcaret adventure park, and a marine encounter with sea lions or dolphins. Packages start at $237 pp per night dbl at the Grand Velas Riviera Nayarit, with free stays for up to two children ages 12 and younger and 50 percent off rates for children ages 13 to 16. At Grand Velas Riviera Maya, packages start at $345 pp per night dbl, with children ages 4-16 enjoying rates of $99 pp per night. All-inclusive rates cover luxury suite accommodations, a la carte meals, premium beverages, 24-hour en-suite service, fitness center, taxes and gratuities. For more information, call (866) 230-7221 or visit velasresorts.com. There’s nothing like a tropical family getaway—and the Hualalai Resort on Hawaii’s Big Island offers just that. Here, families big and small are welcome to treat themselves with hundreds of opportunities for active exploration or serene relaxation. Just for kids, a variety of marine-oriented activities are designed to show off Hawaii’s ecosystem, including sea turtle tagging, a junior marine biologist program, tidepool explorations and creating recycled marine art. Guests of all ages can enjoy the the property’s Voyages program, which offers more than 200 family-friendly activities, including stand-up paddleboarding, fishing, canoeing and snorkeling, as well as more specialized options such as Hawaiian night golf for kids and starlight spa voyages. And visitors of the Ka‘ūpūlehu Cultural Center can delve into Hawaiian culture with lessons in lei making, hula, the Hawaiian language, star navigation and ukulele lessons. But sometimes it’s nice for families to take a guided tour, where everyone can get completely out of their element, secure in the confidence that they’ll see all the important sites—with knowledgable guides to give a background of each destination, too. And promising “all vacation details taken care of so that guests connect with people and places in every destination,” Tauck is a perfect choice for clients like these. 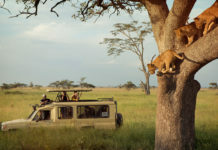 The company offers a variety of family tours to explore all around the world, with itineraries in Africa, Canada, Europe, Latin America and the United States. One Italian itinerary in particular caught our eye: the 8-day Italia Bella: Rome to Venice. On this tour, clients young and old will step into Italy’s past, with a visit to the Vatican’s Sistine Chapel and an after-hours tour of the museums; an exploration of the medieval tunnels of Orvieto; a stop at the Leaning Tower of Pisa to learn why it leans; and a mask-making session in Venice. Further cultural interactions include a pizza-making demonstration and meeting with an art historian for a tour of the world’s oldest art gallery, the Uffizi Gallery in Florence. 2012 departures for the Italia Bella: Rome to Venice itinerary start at $4,290 pp, with a $100 discount available for children 11 and under. Overnight accommodations are at The Westin Excelsior, Rome; The St. Regis Florence and The Westin Europa & Regina, Venice. For more information, call (800) 788-7885 or visit tauck.com/family-travel.